From needing to find Halloween decor to having to make sure you have some scary awesome Halloween ideas, it can be difficult. However, having quality decorations – or scary Halloween decorations – can be a real scare of a treat to make. It’s no wonder that DIY has become the cool thing to do for decorations for Halloween. From front door jazz and funky garage door ideas, there are so many different things that can be created on a $100 budget. Some can be created for even less, making DIY Halloween decorations a much more attainable goal for this year than it may have been in years past. Whether you happen to have duct tape on hand, or have just had a birthday party and have six feet of leftover green crepe paper, you can put it to use via these fun projects. Even a simple crate becomes a piece of the decor! One such idea for outdoor Halloween decorations is to decorate a large banner. The banner can be the full length of the door, or only a partial piece of the length. 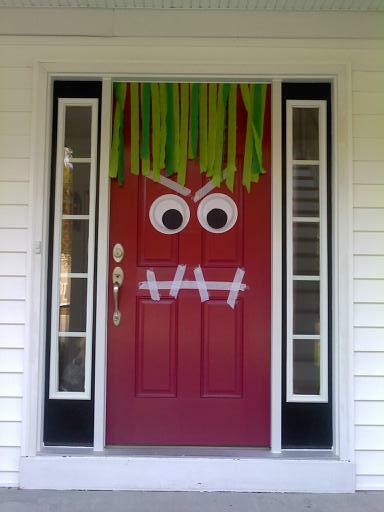 Since door decorations can be particularly inviting or scary, if there are little kids in the neighborhood, try to decorate a banner with something cartoon-ish. The banner should also reflect the personalities of those living inside. Fringes can also be added to the banners – whether it’s pom-poms or straw. For a fun twist, candy stickers and funky texts can be added if a drawing is not your speed. When it comes to Halloween ideas, nothing seems to reflect the holiday better than barren trees with crows flying around. A removable tree decal can really help set the mood for the holiday. While decorated pumpkins and porch signs can create the mood, a large tree can really add a helping branch. Crow decals can add life to the tree, and stuffed crows on the banister of the porch can add even more to the life of the tree. If crows aren’t your style, fake leaves can be drawn on paper and added to the tree – which would then make a really cool party game. While hanging a full door covering can be difficult, making a mummy on your door is completely worth it. Bandages or paper tape can be used to create an opaque white sheet on your door. Black construction paper can be cut into a mouth and pupils for the eyes. White construction paper is used to create the corneas of the eyes. However, make sure you leave the knob and whatever locks are on the door uncovered – otherwise it’ll be a scary situation. 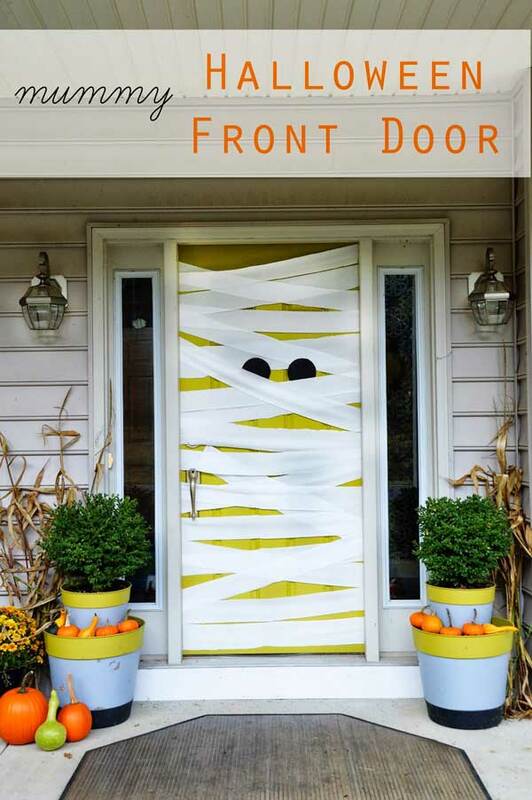 The best part about this fun Halloween front door decoration is that the bandages can be as thick or as thin as you want them to be. 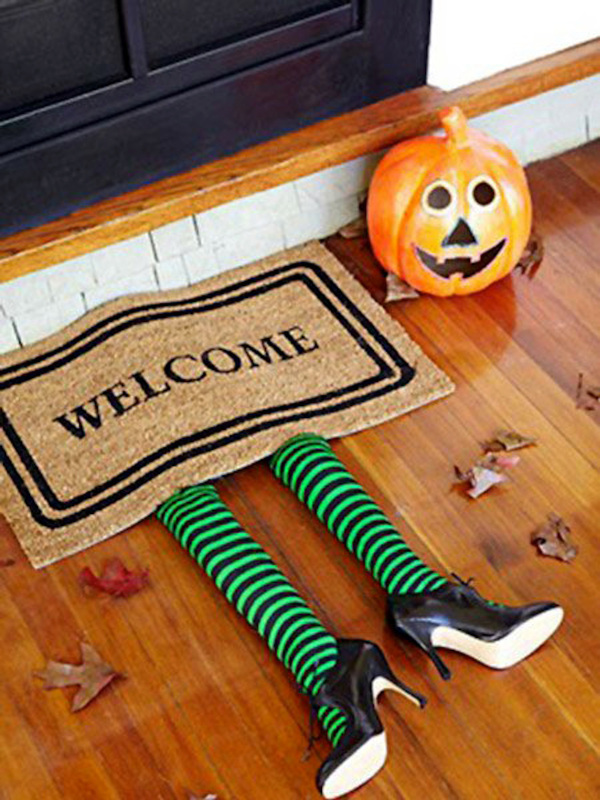 Welcome guests inside your home – if they dare – by creating this unique front door decoration for Halloween. Little trick-or-treaters will be amused and a little bit scared by your imagination and creativity, while most parents will find it downright funny. Stuff the striped socks with newspaper to create a little depth and added bulk. Use a worn-our pair of pointy-toe heels to finish. Any mat will do as long as it inscribed with a warm greeting (it’s not as funny without the warm greeting). 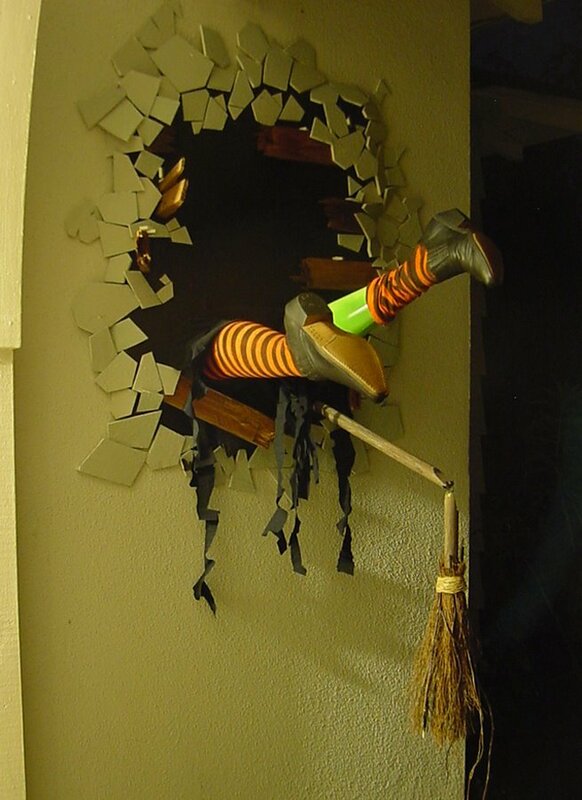 This fun front door decoration never gets old as most people have seen The Wizard of Oz at least once. Using wood and spray paint, make teeth for your house. The teeth are free handed to create a menacing look. There are edges on the sides to hold the teeth up so that there is no need to use nails. Permanent markers are used to mark out the teeth on the wood before cutting them out. Spray paint in white, red, and black is used to create bloody gums and tips of the teeth and decaying teeth. The eyes are created with card board and permanent marker (in two shades of whatever color). Red is added and voila! Hang them up and your house is ready to eat anyone alive. 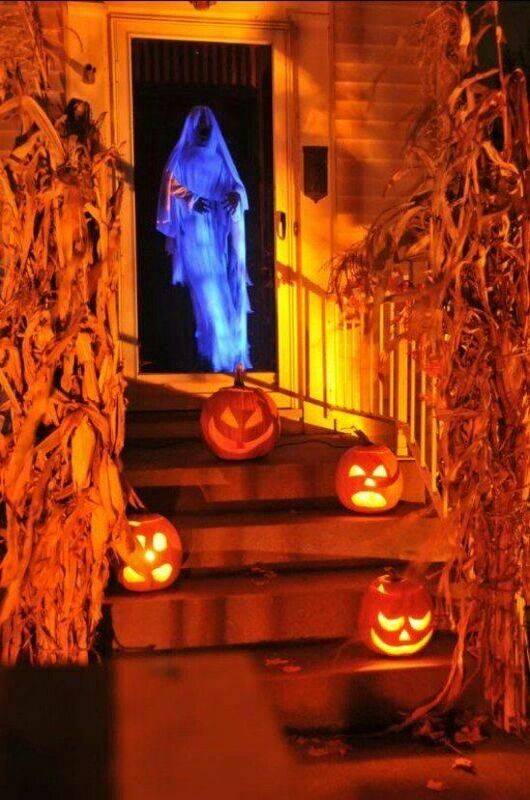 Halloween front door decors have never been so creepy, or so versatile – this makes a great addition to any haunted house. 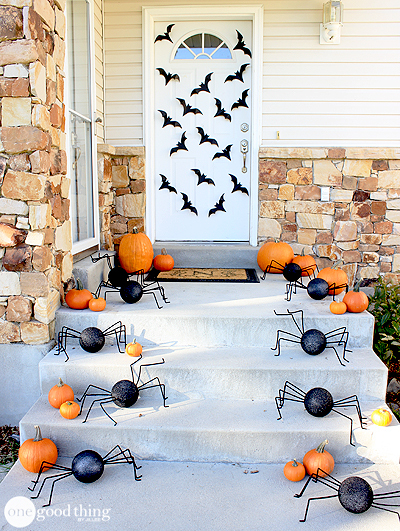 While decorating ideas can be difficult to come across, this spider webby idea can scare anyone. Window clings create a scary giant spider and web. Rat clings can be added to the bottom of the window or the screen door to show a better, scarier scene. 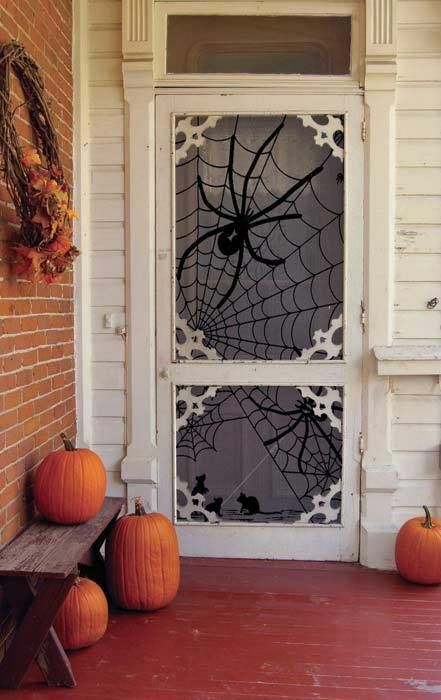 The spider web can be created from a window cling or from the fake spider webs available around this time of year. DIY Halloween door decorations have a lot going on this one – the spider and its web can be created with window paint and a steady hand instead of store bought materials, or with tape. This is quite involved for outdoor Halloween decorations. Black foam creates the background. After the background has been cut, cut foam boards into irregular board shapes. Since they don’t look like wood, a wood grain tool is used once the foam has been painted gray. It has to be done when the paint is wet. Then arrange them on the background as you like. For cartoony zombie arms, use store bought skeleton arms and paint them a bright, neon green. Painting the ends that will connect to the foam background black will help give the impression that they really are coming out of the shadows. Eyeballs are created using ping pong balls cut in half and neon green paint pens. To hang it up, add picture hanging wire on the top and a suction cup hook on the window. 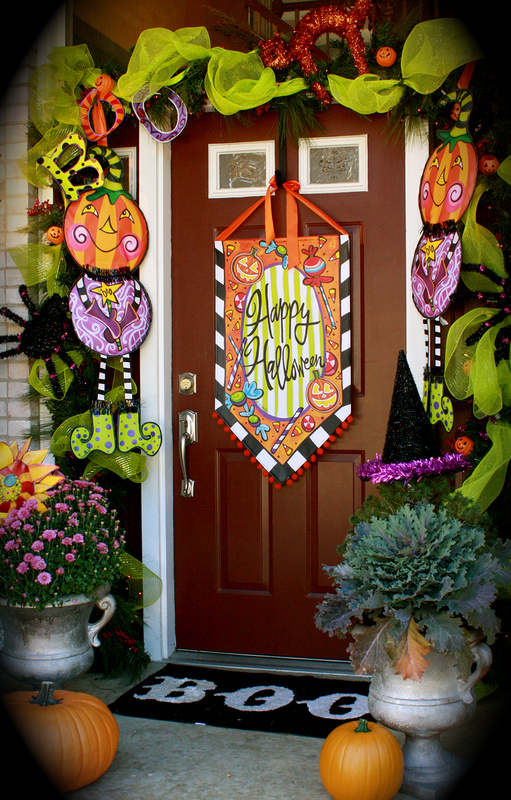 If crepe paper, duct tape, and paper plates have one thing in common, it’s that they can create wonderful Halloween front door decors. Pick up some crepe paper in any color that contrasts your door and hang strips from the top of the door. The paper plates become the eyes when black circles are drawn on. Duct tape them on the door. Then use the duct tape to create eye brows and a mouth. Style it however you want. Kids across the neighborhood will enjoy looking at your creepy monster, and it’ll be a hoot to create if your own kids help. Even if you don’t have kids, this monster gives the creator one great time while putting it up. 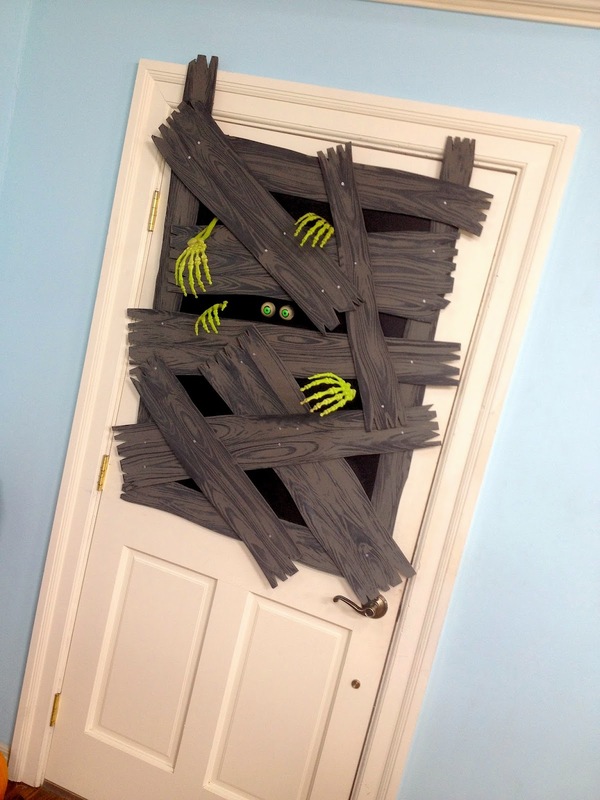 This Halloween door decoration is not for the faint of heart, but if you’re imaginative, crafty and enjoy a challenge, then this decoration is just for you. Purchase a pair of mannequin legs and decorate with paint or cover with a pair of old stockings. You can get as detailed as you want with this project – from the shoe selection to the number of cracks in the wall – it’s all up to you. The plywood base is painted a matte black. Use foam core to simulate broken plaster – align to create a circle – and now you have the dark hole. Pumpkins with scary lit up faces are sure to bring a smile to everyone’s lips this Halloween. 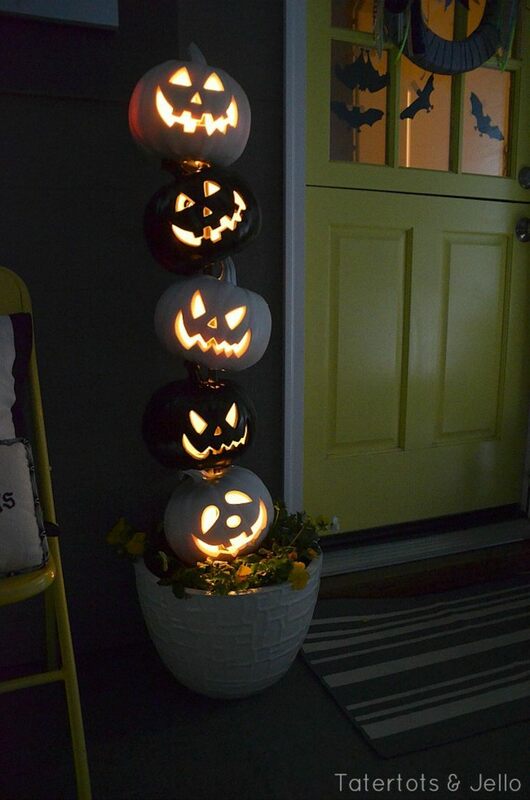 To make sure this front porch decoration is visible from the street, paint some of the lighted pumpkins white and the rest black or leave orange. Decorate an old planter or use a neutral colored one that doesn’t distract from your handiwork. Use a sturdy dowel that can carry the weight of five small to medium-sized pumpkins. Alternate pumpkin colors when placing. Hide that electrical cord as best you can so people see your decorating savvy rather than a thick orange or black trip hazard. While blow up ghosts and plastic skeletons dressed up can cost a lot, taking a simple plastic skeleton can create such an interesting effect. Cool Halloween decorations follow plastic skeletons everywhere. An old white dress can be purchased from a thrift shop or found in your closet. White tulle or mesh can be purchased as well for a fuller look. If the dress is too long for the skeleton, use leftover fabric to create a veil. A spooky Specter bride is preceded by pumpkins as she walks down the aisle – which is your front porch and steps in this case. It doesn’t even have to be a bride. It could simply be a ghost! 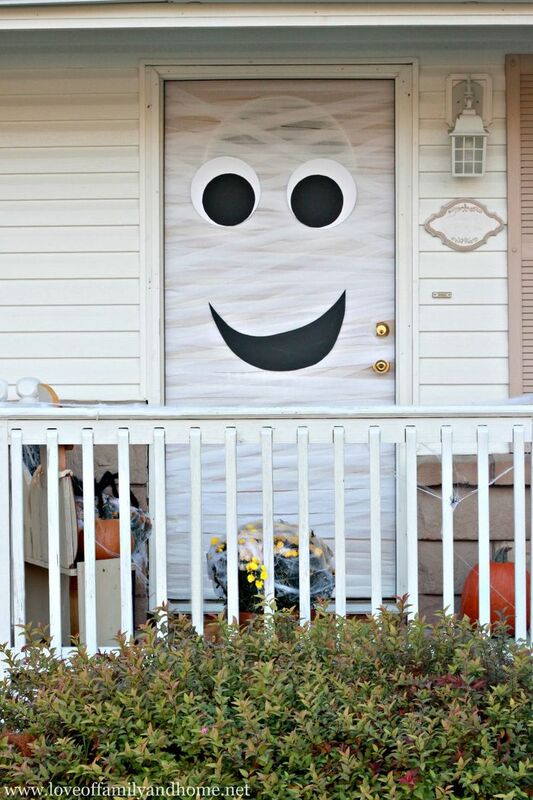 This is an easy Halloween door decoration idea if you’re a little busy this year or if you’re new to crafting. All you need is an old wood or plastic square or rectangular picture frame of any size, colored yarn and some tape to hold it all together. Choose from a wide variety of yarn colors – from white, black or yellow for a more traditional Halloween look to tie-dyed yarn for a more psychedelic vibe – whatever suits your mood. 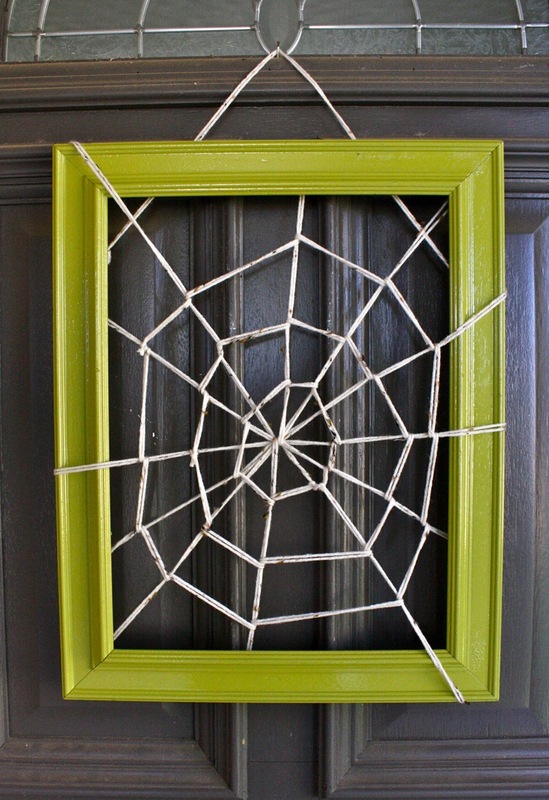 Weave your own spooky web and then hang it on your front door using some leftover yarn and a wreath hanger. 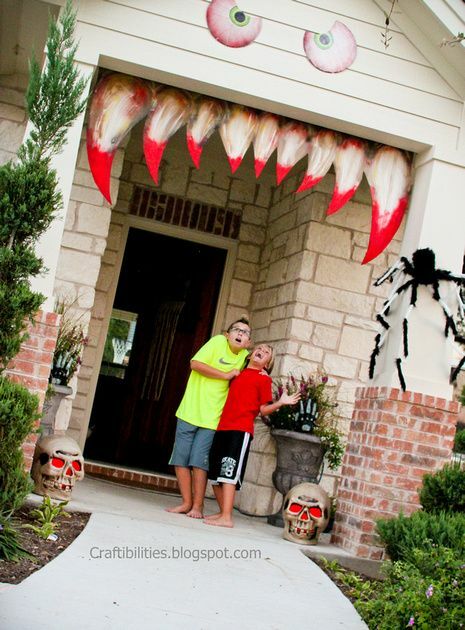 Halloween door decorations and ideas don’t always have to involve more than three items. White fabric can be taped to the back of the door after it has been wrapped around the door. Black paper or fabric circles make eyes. A mummy is a one of a kind thing, and the best part is that the front will look good, no matter how ugly or disorganized the back may look. 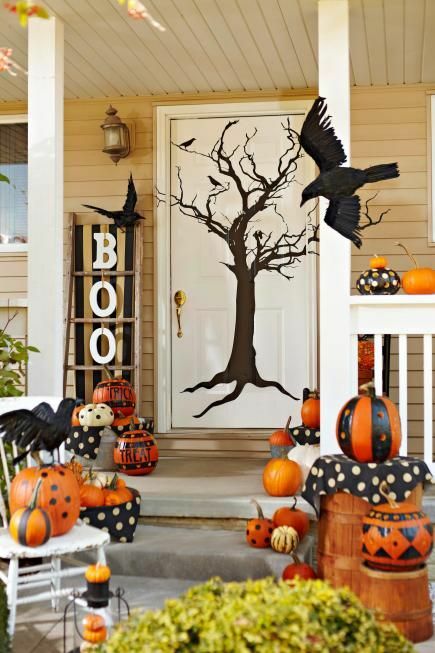 Whether it is cartoony or as lifelike as possible, this is one of the best front door decoration ideas out there for a busy family that wants to make their front door ready for this ghoulish holiday. The iconic striped socks in this decoration evoke memories of watching The Wizard of Oz with a bowlful of popcorn. Keep the memory of Dorothy and her band of misfit heroes alive with this colorful Halloween door hanger. To create a realistic look, you can stuff each sock with old newspaper, other socks or old T-shirts. Choose two different colors of tulle to create contrast and visual interest. Black and yellow works well, as does black and orange, or white and orange – dark colors provide greater contrast against the striped socks. Use a hot glue gun to hold each piece together. Using black paper or fabric, bats can be traced and cut out to decorate your front door. They can be put on the front door via tape or any other method that you like. A bat template can be found for free on a lot of different websites. Spiders can be created with Styrofoam balls. These are spray painted black. Black pipe cleaners are used as legs, and voila! These Halloween door decorations have a life of their own, and boy do they look the part. For something a little more cartoony, a different color can be used – which also creates an intense look depending on the colors used. A large wooden plank is usually an obstacle. However, not this Halloween. A DIY Halloween door decoration this is not. This is a porch decoration. 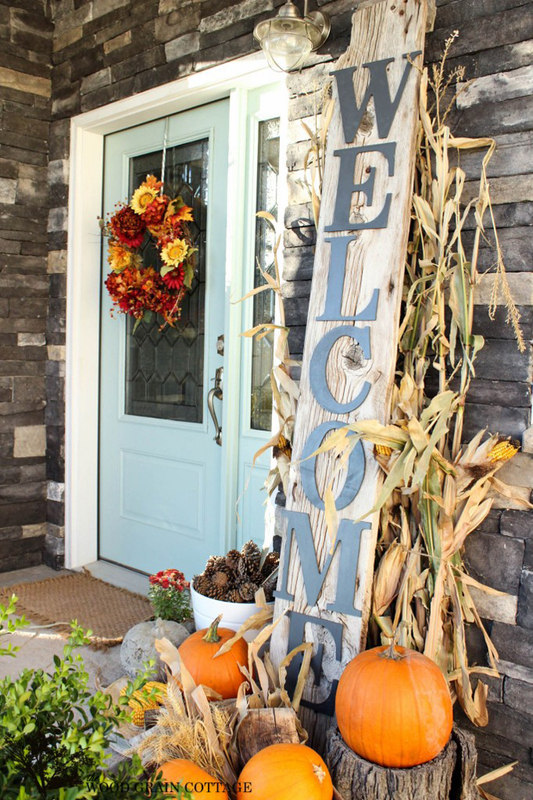 Spray paint and stencils is one way to create this spooky welcome sign. Or the letters can be purchased from a woodworking shop or other area and simply nailed on in the right order. These Halloween house decorations are quite a pop from the traditional ones found in stores, and can be painted in colors to reflect the personality of the family. Who wouldn’t want that?